Striker Ashley Barnes says that the victory over Brighton - which arrested an eight game winless run - is just a small pixel that forms part of a much bigger picture. 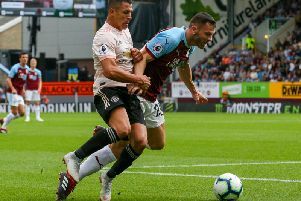 The 29-year-old, who has made just four starts in the Premier League this season, wasn’t downplaying the importance of the three points, nor did he take a back seat amid the celebrations, but he acknowledges that the Clarets need to back it up. Ahead of tomorrow’s game against Spurs, who qualified for the Champions League knockout phase midweek, Barnes said: “It’s a massive win and there was a lot of relief in the changing room there. “It was an amazing feeling, it’s been a long time coming. We hadn’t won so that’s a massive feeling and hopefully we can build on that now. “It doesn’t stop there, though, we need to keep going, we need to keep being ugly. I thought we were back to that and we came away with the points. Climbing out of the bottom three has provided Sean Dyche’s side with a significant psychological boost heading in to the festive period, giving the players the shot in the arm that was needed. The Clarets travel to Wembley tomorrow and then take on Arsenal at the Emirates just days before Christmas. But, according to Barnes, the squad isn’t fazed by the challenge ahead. “It’s massive and it gives everyone a lift,” he said. “You could see by everyone’s reaction at the end of the game just how big a win that was. He added: “It’s a massive game, every one is huge in this league. We know in the changing room that every game is massive. We’ll keep banging on that door and continue performing as well as possible.